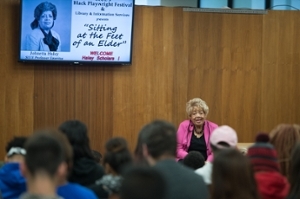 Haley was the center piece in the presentation of “Sitting at the Feet of an Elder,” which was part of SIUE’s first Black Playwright Festival that runs through Sunday, Oct. 15. Her father, John Randolph graduated from Gammon Theological Seminary. Haley’s mother, Willie Smith, graduated from Lincoln Institute, later to become Lincoln University. She spoke about the challenges of going to college and trying to find work to help pay for her schooling. “As a college student it was hard to find a job, because I was black,” Haley said. “I took a written test to be a dish washer at McCrory’s Ten Cent Store in downtown St. Louis. Haley graduated from Lincoln in 1945 and later went on to become the first woman chair of the school’s Board of Trustees. “A couple of the men walked out of the meeting, but I was the chair for five years,” she said. In September 1955, Haley was one of four teachers who integrated Kirkwood Public Schools. She was the vocal music director and chairperson of the Nipher Junior High School. “There were 1,500 parents who signed a petition that said they didn’t want us,” she said. Haley joined the SIUE faculty in 1972 as an assistant professor in the Department of Music in the School of Fine Arts and Communications. She rose through the SIUE ranks to associate professor in 1978 and to professor in 1984. She was named professor emeritus in 1993 by the SIUE Department of Music upon her retirement. Read more about Haley’s accomplishments in SIUE News. In 1994, SIUE’s minority scholarship program was named the Johnetta Haley Scholars Academy in honor of her many contributions to the University and to the East St. Louis community. Today, SIUE has 360 Johnetta Haley Scholars. Earleen Patterson, PhD, director of Student Opportunities for Academic Success (SOAR) coordinates the Johnetta Haley Scholarship program. 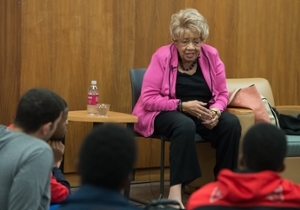 SIUE Emeritus Professor Johnetta Haley shares her life story with SIUE college students.